Please inform us of any additions or corrections you would like to see. Verifying the correct VAS pulse / the "stress field"
We assume you have already read the Lightfield Systems tools page on the website for the background on HIGS and how it can be used with a vibrational toolbox. This manual covers some of the suggestions and guidelines for how to get started using the HIGS system. As explained in the News document, HIGS provides a way to ask questions of the client's heart-intelligence, that we can imagine is connected to their higher self, guidance, or higher level templates. The wisdom at those levels knows the proper colors and sounds and sequencing to best open the energy doorways. HIGS provides a way to quickly ask many questions about what is the most appropriate instrument, color, frequency, positioning, etc. It does this using a pulse reading system developed by Dr. Paul Nogier, called the VAS (Vascular Autonomic Signal). The following manual outlines how to learn this pulse reading skill. However most people learn best by trying and experimenting in the presence of a mentor. If you would like to participate in a small group training class please contact us. At the moment, we are offering the class free to purchasers of any instrument or publication from Lightfield Systems. Please read this manual before attending the class so you are familiar with the terminology. Nogier and his colleagues developed a whole system of therapy and practice called Auricular Medicine or Auricular Therapy. (The auricle is the reflexology map located on the surface of the ear). The material in this manual gives a very brief introduction to the VAS, but it is sufficient to get started. You may want to connect up with auricular practitioners in your area to stay abreast of new developments. I learned the pulse reading technique from Dr. Michael Adams, N.D., who now practices in Toronto, Canada. From what I can tell, there are many schools of thought about auricular work, what are the best techniques, etc. All I can say is that the technique I learned from Michael is straightforward and easy to use. Some of the "earlier" techniques he mentioned seemed quite complex and even unwieldy. So use your judgment and discretion when talking with other practitioners of auricular work, sometimes "small is beautiful". The VAS is measuring a standing wave that forms in the radial artery, just proximal (i.e. towards the heart) of the wrist joint. This standing wave is the result of a collision of pressure waves, one coming from the heart, and one created from the back pressure formed when the outgoing wave hits the capillaries (small blood vessels) in the fingertips. The tension in the capillaries is under control of the autonomic nervous system. As is the general tone of all involuntary muscle systems in the body, including the heart and muscles lining all the blood vessels. So this standing wave created near the wrist is in the form of a palpable bulge or pressure node that can be felt with the tip of the thumb. The location and intensity of this bulge shifts under control of the autonomic nervous system. Hence the name of the system, the Vascular Autonomic Signal. The bulge actually changes both in intensity and in location. The high point of the bulge can move either proximal (toward) or distally (away) from the heart, a slight distance, say perhaps a sixteenth of an inch. Initially as you are learning the VAS, you will be aware primarily of the intensity (the height) change in this bulge. But as your thumb tip becomes more sensitive, you will also become aware of the proximal/distal motion of this bulge. This is important because certain information and discrimination is available from the position changes of the bulge. This is discussed in a later section. 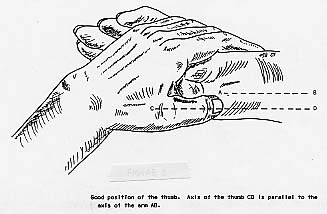 The positioning of the thumb is critical in being able to detect the VAS correctly. This pulse system uses the thumb instead of the fingers for measuring the pulse, because the tip of the thumb contains the most and highest density of nerve receptors of all the fingers. So don't believe any bad reputation the thumb might have as a pulse detector, this is a unique system developed in France for this specific purpose. It is different than other pulse systems such as the Western, Chinese or Ayurvedic. Typically when working with a client, they will be laying on their back on a table. You will then be using one of their wrists to measure the pulse and simultaneously controlling your instruments. Hence you will want to use your non-dominant hand (left hand for most) to measure the pulse, while leaving your dominant (right hand for most) free for holding your various tools. If the client is laying down, the best arrangement is to use a small side chair (and pillow) or simply a wide table to allow them to bend their (usually) left forearm back towards you, where you are sitting in a chair at the head of the table, just a foot above their head. You can use pillows or pads to support their arm in position, and also to give your own arm and hand some support as it measures the pulse over sometimes extended periods. It is also possible to use the VAS where both the client and practitioner are sitting in chairs. In this case you will want to have your knees almost touching and reach over with your left hand to hold the client's right wrist. Make sure that they relax the arm and hand fully if using this seated position. Their hand should be resting comfortably, palm up, on their right leg. Once you have the arm positioned comfortably, you can now begin to search for the VAS pulse bulge we mentioned earlier. As we noted, the most sensitive part of the thumb is the tip. However this is also a very small area, only about a quarter inch in diameter. While searching for the pulse, it is helpful to have a wider area to work with. Therefore it is helpful to use the whole flat of the thumb while you are searching around for the bulge. Then when you have it approximately, rock up your thumb to about a 45 degree angle and position the bulge precisely under the center of your thumb tip. The radial artery is the artery that runs along the side of the radius bone of the forearm. This is the bone that is on the same side of the forearm as the thumb. The pulse bulge is located at the wrist position, or slightly proximal (say up to an inch) away from the wrist (towards the heart). Do not have your thumb at an angle, if you do that you can distort some of the measurements. Verifying the correct VAS pulse / locating the "stress field"
Once you have your thumb tip over the bulge, you will want to verify that it is picking up the correct VAS response. We do this by inducing a VAS response, then noticing the pulse change. There are several ways to create a VAS response, but perhaps the easiest is a concept I believe was developed by Michael Adams. He says that there is a "stress field" around the body. In other words, the more stressed you are, the larger is this field. The less stressed, the smaller is the field. The field is like an envelope or bubble around your body. You can imagine that when you are maximally stressed, you would not want anyone standing within several feet of you! This is kind of like the idea of an "aura", but in reverse. With the aura, the bigger the better, your energy can be really expansive. With the stress field, bigger is more stressed. The idea is that during the treatment session, as the client's stress field reduces, you will be able to measure it using this technique. And as the session is just starting out, you will be able to see where that stress field is initially located. When the session is done, the stress field will actually reduce to near zero, and you will be able to measure that also. You can measure the boundary of this so called stress field by using what is called a "waver". (Because we are going to be waving it back and forth in a moment.) This is a piece of paper, what we might call an intention amplifier , on the piece of paper is written the intention, "locate field boundary". What you do is hold that intention in your mind, as you move the piece of paper towards and away from the client's body. You basically "bounce" the paper on and off of the boundary, locating it in space. As you are doing this, the pulse will register. It will get stronger as you contact the boundary, then drop off as you go away from the boundary. Normally the waver is moved in and out from the surface of the person's ear, but you can use any part of their body; the ears / head is simply right in front of you if the person is reclining. This then is the test we use to verify that our thumb position is located correctly. If you do not locate the stress field boundary, i.e. feel the pulse change in intensity, as you wave the waver back and forth --then you do not have your thumb in the proper position. There could be several reasons for this: (1) you may be using too much thumb pressure. You need to moderate the use of pressure here. Too little and you will not be able to sense anything. Too much and you will squash the artery so much that the effect disappears. Try experimenting with the amount of pressure you use. It will differ for each client, and you will have to just make the necessary adjustments for that. (2) Another possibility is that your thumb tip has become off-center from the pulse bulge in the artery. If this is the case, then try using the flat of your thumb again to locate the most prominent pulse bulge and try this procedure again. (Rock up to 45 degrees, check for waver response). You must have the proper positioning to continue with the next steps. Because you are developing a sensitivity in your thumb that you did not have before, it is useful to hone your skills with a few intermediate steps, before we introduce the HIGS menu system. It's possible that your pulse skills are already quite sensitive, or that you are a dowser or muscle tester (AK, applied kinesiology) who is accustomed to fine motor and sensory skills. If that is the case, you might be able "jump ahead of the class", and skip to the section below entitled AK Jumpstart. But please scan the intermediate paragraphs to get an overview of what you are skipping. If you attend one of our classes, you will see that the following steps only take a few minutes to do. It is helpful to use the pulse to experience what it feels like to "find" a point that needs balancing on the ear. Nogier developed the auricular system, using the ear as a holographic map of the body. This is similar to the maps you might be aware of on the feet and hands (reflexology). However the ear has certain advantages because it has enervation from several cranial nerves of the brain: the vagus, the trigeminal and the cervical plexus. Thus it works both holographically and through the nervous system. If the client is in a seated position, it is possible to locate and balance points on the back of the hand. You would use the opposite hand to the one you are reading the pulse on. However the ear system usually has the more powerful effect. In the previous section we used an intention amplifier called a "waver". For work in the auricular system, we can benefit from two other intention amplifiers. Again these are just small pieces of paper with an intention written upon them. 3M Post-It pads (stuck back to back) are handy for this. One of the papers should say "Find Causal Chain points (neck/chest)". The other paper is labeled "Remove Blockages (arm)". The figure below shows a map of the body indicating which areas are enervated by the parasympathetic branch of the autonomic nervous system. And which areas are enervated by the sympathetic branch. Basically the arms and legs are sympathetic, and the head and torso, parasympathetic. Michael Adams says that any substance or intention placed in the sympathetic zones removes micro-information from the body. Conversely, intention or substances placed on the parasympathetic zones adds micro-information to the body energy system. To facilitate finding out-of-balance points on the ear, we use these two intention amplifiers. The paper "Find Causal Chain points (neck/chest)" is placed on the chest below the neck. This asks the energy field of the body to please present a point on the ear that would like to be balanced. If we imagine that the imbalances or stresses occurred to the person in a certain order, this intention unwinds the stresses in a reverse order. Basically untieing the knots of stress one at a time, going backwards in time. The second intention "Remove Blockages (arm)" is placed on the arm. Since this is a sympathetic area, it asks the body to remove the influence of any blockages in the body bio-information transfer system. This is so we get clear information about which are the correct points. Sometimes blockages can occur in meridian energy flow due to scars or other trauma existing in the body. This intention temporarily removes that "short circuit" in the system. If the client is seated instead of laying down, you can place the amplifiers in other convenient locations, for example you could use the leg instead of the arm. And you could place the "Find Causal Chain" amplifier on the shoulder, near the neck. Now we are ready to actually find a point on the ear that would like to be balanced. This is most easily done with a small penlight flashlight. This type of flashlight has a type 222 bulb with a small glass lens on the tip of the bulb. This usually casts a nicely defined, small circle of light, about 3 inches wide when the penlight is about 6 inches from the surface of the ear. You will be scanning the ear that is closest to your dominant hand, usually the right ear. In 99.9% of the people I work with, the brain circuitry (corpus callosum) is open enough so that working on the right ear, works on both sides of the body. The point is found by slowly scanning the beam of the penlight, first left to right, right to left over the surface of the ear. As the edge of the beam crosses the point, a response will occur in the pulse. Basically this response shows you a shallowly curved line on which the point lies. You can try bumping into the point from both left and right and verify the location of this line (the pulse will increase in each case). Now you will do a similar scanning, but with the beam going from top to bottom over the ear. This will give you the location of another line, intersecting the first line you found. At that intersection is the point we are looking for. This procedure basically gives you that X and Y coordinate of the point. You can now try bumping into the point from different sides and angles to verify that you have found it correctly. You can also verify the point location by using a small pointer, say a pen or pencil. As the pen or pencil gets over the point, the pulse response will occur. Note that the pointer tool is a bit harder to use than the "line" tool of the flashlight, because the line tool searches across its entire length of the beam, whereas the point is only a point. Thus for beginners, it may be easier for you to find points using the penlight than with a pointer tool. Here is another fine point that occurs when using a pointer tool. It is good to be aware of this now, because you will eventually use the pointer tool on your HIGS menus, and you want to be aware of this phenomena. Sometimes when trying to locate a point or a menu choice, there are several competing points or choices. I.e. several choices are possible, but usually, one choice or point is the strongest and best candidate. Michael Adams says that the points give off what you could call a "cone" of energy or detection ability. Several points may be giving off weak signals, and if you start scanning with your pointer at a close distance above the surface, your pointer will be fooled by the possibly many weak choices of points that are competing with the stronger point. Instead of the "energy cone" idea, you can also think of this as a hand-eye coordination effect. Scanning at a distance above the surface allows your eye to take in a wider area of prospective points and choose the one with the most (greatest) response. If you are scanning too close, you don't get this "comparison" effect. When I use my menu system on most clients, and the menu has asked for ear balancing, it has generally indicates to start with the red laser pointer; this seems to be a common pattern for the first several points. This is perhaps because the red laser pointer is a strong energy effect, being coherent, narrow bandwidth light. If you don't have a laser pointer, but do have a CPL pen, try choosing a red filter, since red is good, physical level color to start out with. If you don't have any kind of light pen, just use the cap from a ballpoint pen or some other gently rounded object. You don't want to poke the person! Nor use too much pressure, just a light touch. With the laser you do not need to touch the ear point with the tip of the pen, but with the CPL or pen cap you would. So if you now take out your pointer, and aim it or touch it at the point we just found. All the time you can monitor the pulse. It should help you to keep the point centered while you are balancing it. While you are over the point, experiment with slow, very tiny movements from side to side or top to bottom. I call these micromovements. You are probably just moving less than a 1/16 of an inch, back and forth over the point. As you go back and forth, you will notice the edges of the point indicate with the pulse. It is like a little wall around the point. When you first start balancing the point, the pulse and the edges feel somewhat spiky and hard. As you stay longer on the point, a minute, two minutes, etc., you will notice the point and edges start to feel more soft and mushy. Sometimes also the pulse will return to complete normal (like you even weren't there). Both of these are signs that the point is "complete", and the bioinformation got through. I frequently start off my sessions with using the Qigong Machine at the clients feet. I explain to them my impression that all the cells in the body have consciousness, and that when we place our attention on the sensations that are happening in the body, it gives the cells more permission to communicate with each other and also to raise that cellular awareness to our conscious attention. It basically gives everybody more permission to network. I go on to use the Qigong Machine briefly at their shoulders and head, also asking for feedback. With this as background, it then becomes more easy to check in with the client during the session to see what is going on inside. It also focuses their awareness away from the mental chatter and analyzing, into a more whole body wisdom. It is the case that sometimes these sensations are doorways into other awarenesses. For example, something that first starts out as a sensation in the chest or heart area, may transition into connection with the underlying emotions in that area. Or the sensation may bring up an insight or awareness about how some body armoring came into place. So after a series of balancing points or sequence of balancing steps in the menu system, I take notice of where the client is at, and sometimes ask them what they notice going on in the body. Even as I am starting the first point or step in the session, I ask them to tune in and see where they might feel this. Here is the point where our AK practitioners or dowsers might be reentering. (Others can skip this section if desired). The section following this one discusses the use of the HIGS menu system. The classic way that dowsers or AK'ers "train" themselves to detect a response is to use the phrases: "show me a yes", and "show me a no". The response is either coming from internally (e.g. with a pendulum or L-rod), or from the client (muscle testing). You can train yourself with the HIGS menu the same way. With your thumb in position on your client's arm, with your other hand, scan your pen at a distance of 4 inches or so over the HIGS menu card, in the lower right corner. This area contains the letters Y and N aligned vertically. Standing for yes and no. The M and D stand for more and done, discussed below. See if you can get a yes/no response from the pulse with your scanning over the Y N area on the menu card. The pulse will increase in strength over the appropriate letter, if you are picking it up correctly. Start at a distance of 4 inches or so, then slowly get closer to the card as you verify the boundaries of the "cone" effect discussed in the previous sections. If all this goes well and you are getting a response, continue below. Otherwise you might want to increase your thumb sensitivity by doing the exercises in the above sections. OK, now we are ready for the actual use of the HIGS menu system to guide the session. The ear balancing mentioned above was just a training session for our scanning of the menus we will be using to make choices. We normally only use the ear balancing if the pulse asks for it via the menus. The HIGS menu system uses the same pulse read out as we learned on the ear points, to guide the selection of tools and parameters during the session. Instead of scanning the surface of the ear or hand for points, we are scanning the surface of a piece of paper, which contains choices about which instruments and parameters to use. You might wonder, how does this all work? Well, think of this. Remember back when we balanced the point on the ear. If this was just a physiological response, i.e. if the body knew where the area of imbalance and stress was, why couldn't it just balance that area itself? What good is bioinformation if the body already has the information? Well my take on this is, the bioinformation is coming from some higher level, some heart intelligence or higher level template that knows the imbalances and what might influence the physical body to start unwinding the knots and reconnecting itself. So this same higher level wisdom is capable of guiding our more global choices of instrument, color, etc. It also makes sense if you realize that the pulse is capable of responding to a map of the ear or body on a piece of paper. The only way this could be working is with some kind of shared consciousness system, wherein this higher wisdom source is aware both of the status of the clients body and the position of your pointer over the paper or map or ear. It is also not that hard to conceive of, given the success of kinesiology or dowsing systems that ask the same questions. I like to think that the pulse system here is a little more objective, since it involves two consciousnesses instead of just one (dowsing), and it certainly is less strain on the client when many questions must be asked (kinesiology). Many dowsing and kinesiology practitioners ask their questions silently, with simply a conscious link to the client in question. 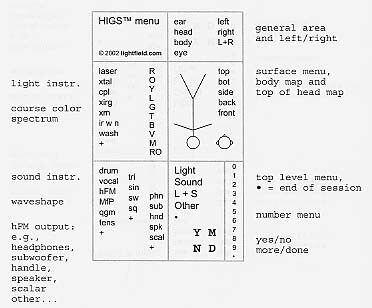 The figure below shows a recent HIGS menu card. Don't print this card out for your own use, instead use the "higs_menu.pdf" file on the disk. Jpeg files and browsers do not always print to scale, and you want the card to be it's full size, which is 3 inches by 5 inches. The HIGS menus are laid out in 3M Post-IT size blocks on the card. This is convenient for customization, but use any format that is best for you. I find the two inch length (arranged vertically) of the post-it's is about the right distance that I can scan easily with my pointer and not miss anything. So try this yourself, scan this menu with your pointer to see which is the most appropriate instrument to proceed with. If you get Light, you would next scan the list of light instruments on the menu card, located in the middle left. If you get Sound, you would next scan for the appropriate sound instrument, located in the lower left of the card. Sometimes we get Light+Sound, this simply means that the pulse wants both light and sound simultaneously. Light and sound can work together very synergistically. The Other category is a catch all, that takes us to another menu with group of lesser used tools. The large dot is what I call an "end of session" indicator, it is a way the pulse can indicate the session is complete or the person has had enough to handle in a session, even if the allotted hour is not yet quite up. The IR is the 880nm infrared instrument. This comes in both a wide and narrow beam version. If I get IR by scanning vertically, I next scan horizontally over the W and N to see which is the appropriate tool. Some of the menus are setup this way, if a vertical scan gives you a major choice, sometimes the horizontal dimension shows some of the subchoices of that main choice. CPL is the color point tool. We have experimented with other tools, e.g. Peter Mandel's (the colorpuncture tool), but find the CPL more effective. I think this is because of several reasons. The CPL beam intensity is much higher than the Mandel, because the Maglite flashlight used has a superior bulb and reflector (elipsoidal) system. The CPL also has a much smaller (1/8" vs. 1/4" diameter) light guide tip. This results in more accuracy in point illumination. Finally the CPL has a very much wider color selection available. If the CPL tool is indicated, then you will need to go to another menu to select the color. The CPL menu is "two dimensional", it shows the major colors in a vertical line, then horizontally, next to each major color, are the various shades of that color (the filter numbers) that can further refine the color choice. Using a two dimensional menu such as the CPL, you can pretend you are scanning for an ear point on this menu and do a horizontal and vertical scan over the filter number after you initially located it, to verify that it is the correct one. XM is the tunable wavelength light source, adjustable in one nanometer increments throughout the visible spectrum (400 to 700 nanometers). If XM is the light instrument chosen, then we next ask for the three digit wavelength number, using the number menu on the lower right of the card. XIRG is the Xenon InfraRed Gold medium beam light source. WASH is a small theatrical fixture (100 watts) that is broadly focused (called a "wash"). It can be used the same filter pack of over 100 different colors that is provided with the CPL. When asking for numbers (e.g. for the XM or a sound oscillator), we mentally frame the question, "what is the first digit"; then get the answer. Then "what is the second digit", etc. If you do not know in advance how many digits are in the "units" portion of the number, ask "how many digits" first (e.g. you might get 2 or 3). Read out each of these numbers, then you can further ask for "first digit after the decimal", "second digit…", etc. That is, if you need the accuracy, which is sometimes the case with low frequency sound settings. It is also a good idea when reading out numbers, to double check after you get the whole number, and reask for each digit again. This is just a confidence check and will give you more assurance that you have the right setting. LASER is the simple continuous wave laser pen pointer. We use an inexpensive one, without any fancy modulation or infrared capability. "Xtal", crystal, could be on either the sound or light menu since they work piezoelectrically with both vibrations. It just ended up here. The "+" plus sign on the menu(s) has a special meaning, that is to say, the instrument or choice being requested, is not on this menu! I.e., some unforseen option is presenting itself here. Skillfull asking of yes/no questions (see below) can pinpoint what is being summoned. MfP stands for "Music for People", also see the website and newsletter. This is a simple but powerful technique of working with people (both of you together) to discover our music that is inside of us. Highly recommended! Sometimes practitioners have TENS units or other electric frequency generators of audible range wavelengths. If you have such devices, you can list them here. If the instrument chosen has a narrow beam of effect, such as the point tools, or the medium beam width tools (XM, XIRG, sound handle-woofer), you will want to ask "where" on the body to position them. The position menu is located on the upper right of the card. The choices here are Body, Eye, Ear, Head. If the instrument is already location specific (for example headphones) or non-specific (e.g. subwoofer or speaker or "wash", then you can skip over the further specific choices for location. If the choice is Body, you can use the (very schematic) body map pictured on the card. I usually work with this guy in the upside down position, just because that is usually the orientation of the person on the table from my perspective. I would first ask, "which surface are we working on", Top, Bottom, Front, Back or Side of the person. Then I would scan over the body picture until I got the approximate location. The "left / right" menu is sometimes helpful for asking about laterality. A scan of the pointer (or finger) over the person's actual body would then pinpoint the location. For this kind scanning over the body surface, especially when printed clothing is involved, be sure to use just your pen or finger rather than some kind of penlight or light pointer on the person's body to scan with. This is because the printed cloth and light projection through that can interfere with each other, giving false indications. After you have the location pinned down, you can then position your instrument over the area indicated. Sometimes with medium beam instruments (such as the XIRG or handle-woofer), you might want to monitor the pulse response whilst moving your instrument towards and away from the body surface; this can usually indicate a good distance to hold the tool at during balancing. If the choice on the location menu is indicated as Head, then again you can use the little person to ask, is it Top, Front or Back, then use the pointer to scan over the front or top view of his head to get an approximate location. Sometimes in my experience, the pulse asks for a Head point, when in fact what I locate with the pointer is a point on the throat, i.e. just below the picture of the head. I assume the pulse is just using that technique to concentrate my attention around the area of the head for scanning purposes. When using the auricular system according to Michael Adam's protocol, there are a couple extra steps that add some nice information. Recall that we used the two little intention amplifiers when we balanced that trial ear point. His protocol contains this extra step: after you have finished balancing the point (turns soft / mushy), you can check to see if the body did indeed "take it", i.e. completely balance. You do this by taking the waver, and moving it toward and away from the ear, as we did earlier to find the stress field location. However this time you hold the intention, "did we finish this point?" If the point is indeed done, then the stress field will appear to have miraculously come all the way into zero. That is, the VAS response will not occur as you bring the waver in, or only occur within a half-inch of the person's ear surface. This means that point is indeed done. Now rarely as you bring that waver in, you will notice that the field did not come all the way in. This usually means that the point moved a little bit or shifted location. You can take out your penlight and try to locate it again; if you do find it shifted, then you can begin balancing the new location. Eventually when the point is fully balanced, the field will come in with your waver and you will know you are done. At that time you can remove the other two intention amplifiers from the neck and arm. The stress field will then pop out to its new location, which should be a little less than what you measured to begin with. This shows you that you have reduced the stress level by that percentage. After you have balanced a series of these ear points, the stress level will eventually come all the way into zero. Meaning there are no more ear points to be found. If the pulse asks you to do a subsequent point on the ear, you can then replace the neck and arm intentions and begin as you did before to locate the point on the ear. After you perform one balancing (e.g. through the ear, or by light or sound elsewhere), you can ask the pulse, "are we done with that last balance, or is there more to do"? This is easily done with the More Done (M/D) items on the lower right of the card. Done indicates we are ready to find the next instrument and location. More indicates that the last adjustment was not quite complete, and that you should continue it until you get the feeling or indication that that is so. More/Done is also helpful during the process of balancing, say with color thru the eyes or a tone thru a speaker or headphones. As long as the frequency or color is "doing something" or being absorbed / processed, the pulse will indicate "more". When the balancing is complete, it will say "done". With point work (e.g. on the ear) and the micromovements involved, you are "constantly" monitoring the pulse while the balancing is going on. But with sound thru the ears or light in the eyes, you can simply check back every minute or so and ask "are we done with this adjustment", which can be less fatiguing than continuous monitoring. If you do get the Done indicator, you are now ready to go back to the top level menu (Light / L+S / Sound / Other / . ) Asking again, what is the most appropriate instrument for this next step? I notice that the pulse seems to like variety, for example if it is working on ear points, it may take a break and ask for some sound work or different kind of light work in the middle of a sequence of points. This makes sense to me. And if you go through the top level each time, you will also pickup any color or wavelength changes the pulse is asking for the next adjustment. This protocol also guarantees you will pickup the dot indicator when the session is complete, which could happen after any adjustment. Particularly if the client has gone through a lot of processing already in the session; you don't want to give the client more than they can handle in one session. The card contains the Yes / No menu, which you can use for any general questions you might have that can be so answered. Sometimes you might just need clarification on some item, or wonder about something of interest to you or the client. Sometimes I also find it helpful, if the client has questions about the impact of some stressor in their environment, or the efficacy of some proposed treatment --to ask the pulse to rate that item on a zero to nine scale, using the number menu on the lower right to get the answer. You can also get numeric ratings of organ system functionality, as dowsing and AK sometimes does. We mentioned earlier that the pulse bulge on the radial artery moves very slightly say 1/16 of an inch proximal or distally along the artery during a VAS indication. You will eventually train your thumb so that it picks up on this. It is a little bit like those piano or guitar tuners that you see with a plus and minus meter indicator. The needle of that meter is normally setting right in the center of the meter, but when the pitch is off, it can indicate how much in the plus or minus direction. Well the pulse is a little bit like that. 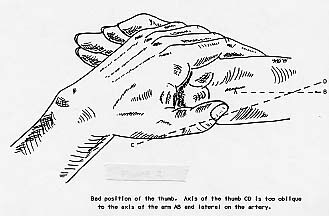 As your thumb gets trained, you will notice that a downward motion of the pointer across a menu item (that is, the one that is indicating, the choice being selected by the pulse), will result in a downward motion of the artery bulge across your thumb tip. And an upward motion of your pointer across that same menu item will result in an upward motion of the artery bulge. This little "meter swing" action, is a verification that you are getting good and valid readouts. Very occasionally / rarely, you will sometimes hit a menu indication, where the motions are reversed. That is, your downward motion over the menu item will result in an upward motion of the artery bulge, and vice versa. Just simply, the pulse indication will "somehow feel wrong" on that item, and usually there is another item on the list that will give the correct positive pulse motion indication. I am not sure what causes such "false indications", my guess it is indecision or doubt on the side of the client or practitioner. Luckily the pulse indication and your sensitivity is a way out of this occurrence. Please also be patient with yourself, any new skill requires some practice, and you will certainly pick it up after your sensory apparatus sensitizes itself. Also the "cone effect" mentioned earlier is another good way to avoid any false indications. Just "back off" and come into the menu slowly, looking for the largest cone. Sometime when doing points on the ear, you will notice that they are clustered, or even forming a small line. (Like a color/connect the dots coloring book!) This perhaps means that somehow the pulse wisdom is asking that we connect up different regions on the holographic map. My impression is that it could be establishing new brain or bioinformation pathways that require more "direction" than the simpler point adjustments. Sorry we are spending so much time on the ear-balancing aspect, this manual had that original emphasis(!) Very rarely (say one out of every 200 clients? ), you might get someone who is only getting bioinformation from the ear-balancing, to appear on the same side of the body as the ear you are treating. In other words, the information is somehow not getting over to the other side. Perhaps the corpus callosum is somehow shut down more in this person. The solution in such a case is simple, if a little awkward. You just balance a few points on the opposite side (the side of your pulse hand), instead of the normal ear you use. The positioning and stretch will be little harder than usual, but not significantly. After a few such points, the left/right communication should have improved, and you can go back to the original ear for the rest of the points. Keep asking for feedback on the body sensations to ensure that the channels stay open. Of course with any kind of work like this, you will want to be in a space of heart-intelligence yourself. This will allow both you and your client to access the truest part of yourselves. Sometimes you might notice your conscious mind creeping in with certain preferences or ideas about what might be right for this client. Just let that go and perhaps ask, "what are you really asking for?" as you are using the menus. This can help remove any bias on your part towards the responses. We have a Yahoo group setup for discussion and brainstorming about HIGS, hFM and other vibrational tools. Visit http://groups.yahoo.com/group/higs , mail is sent to the address higs@yahoogroups.com . I've been thinking of doing a video tutorial on the pulse system. Tell me if you would either like a copy of it, or in helping to produce it. I feel there is a tremendous amount of synergy that is going to happen as we learn from each other, and be creative together. Many pieces of the puzzle coming together.